Another lovely recipe courtesy of Manju Malhi, to whom we are very grateful…. Begin by heating the wok. When hot, add the oil. Then tip in the stir fry mix or the bean sprouts and red pepper. Cook until the vegetables have slightly softened and their tastes have had a chance to intermingle. Add the noodles, fish or oyster sauce, soy sauce, sugar and Chinese Sichuan salt. Mix well, take it off the heat and place into a bowl to let it cool. Place the spring roll wrapper in front of you, with one corner at the bottom so that it resembles a diamond. Brush the four edges of the wrapper with the beaten egg. Next, add the filling in the bottom part of the wrapper in a thin log shape, not touching the edges. Leave the bottom, a few centimetres clear. Lift the wrapper over the top and tuck it in under the filling. Fold over the left side, and then the right side and roll it up to form a tube. Brush a little more egg along the top part and seal the roll. Repeat until all the rolls are finished. Place the pan with the oil for frying over a medium-high heat. 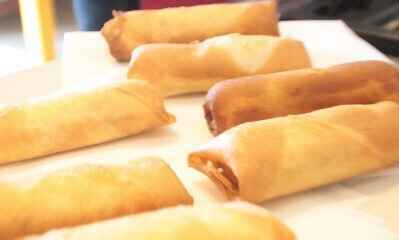 Once the oil is hot, deep fry the spring rolls until lightly brown, which should take only a minute or two until the roll is golden brown. 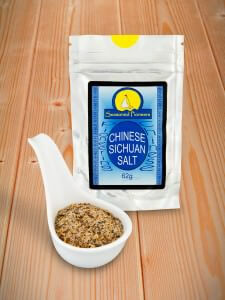 Place them on kitchen paper to drain and serve with sweet chilli sauce.